This is our Giantex 2 Pcs Armless Reception Chair. Powder coated iron tube gives the whole chair a solid support. The seat and back of our chair is padded with sponge. When sitting on the seat and lean against the back, you will feel soft and comfortable. Besides, the back conforms to ergonomic standard and is good for your waist and back. The surface of back and seat is PU leather that is easy to keep clean. Sled Base is steady and evenly disperse gravity from the seat. Non-slip foot pad under sled base makes the chair fixable and protect the floor well. 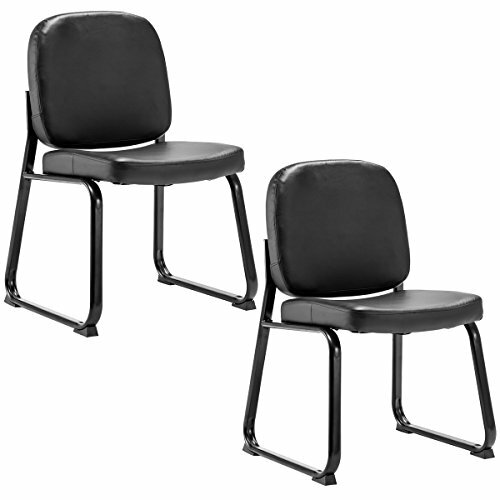 Our armless reception chair is also light and easy for you move. It is really good choice for your office or meeting room! Material: Renewable Sponge, PU leather, PVC, Powder coated iron. Powder Coated Iron Construction- Our armless reception chair construction is mainly made of powder coated iron which is durable and solid. The powder coated process enables the whole frame to be rust resistant and long lasting. Steady and Heavy Duty Sled Base- Two Sled legs are wide and thick enough to support the whole chair. Besides sled base distribute weight from the seat and evenly put pressure on the floor. It also enables this chair move smoothly over floor or carpet. Simple to Keep Clean - Our reception chair is mainly made of black PU leather. The back and seat is smooth and just needs to be wiped with dry or wet towel. Ergonomic Back Design- Our reception chair accords with ergonomic standard. It will make you feel comfortable and relaxed while leaning you back against it. This design is also good for your waist. Non-Slip Foot Pad- Foot pads at bottom is useful for protecting the floor well. It can also fix the chair and make it stable. Besides, this armless hair is light and easy for you to move it. View More In Guest & Reception Chairs.